A female skeleton found at the site with hands bound and feet removed. The Thames Water company was in the midst of a major pipe-laying project in Oxfordshire when its workers stumbled upon an ancient settlement and its associated graves. Experts from Cotswold Archaeology were called into investigate, according to a statement. The scientists pulled out various items, such as pottery, flint cutting tools, animal bones, a decorative comb—and no less than 26 skeletons. The site, known as Childrey Warren, is around 3,000 years old, dating back to England’s Iron Age and prior to the Roman conquest. A skeleton with skull placed at its feet. 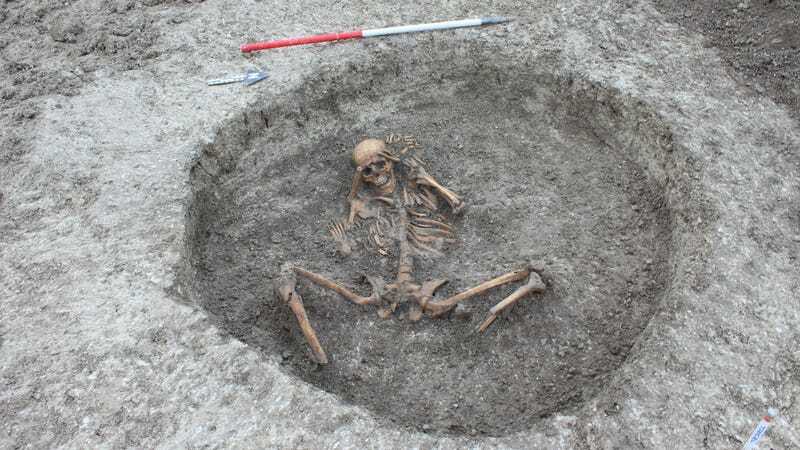 On that last find, British archaeologists have seen this sort of thing before, including at a 1,700-year-old site in Suffolk, England, involving over 50 skeletons, some decapitated. The reasons behind this beheading practice aren’t fully understood, but in the case of the Suffolk skeletons, the heads were removed after death. Graves such as these are referred to as “deviant burials,” as they’re out of alignment with most graves left behind by a culture. To the people who participated in these practices, however, it’s fair to say they were not “deviant,” likely playing some sort of important role in the local tradition. An animal skull found at the site.